Today we consider the anniversary of Phase Two of the 1917 Russian Revolution, just eight months after Tsar Nicholas II’s regime was deposed and replaced by a Provisional Government. But the seizure of power by the Bolsheviks in their so-called October Revolution dwarfs even the monumental significance of toppling a millennium-long empire. For this epochal landmark in history marks the very moment when Marxism ceased to be a theory. Henceforth, socialism and communism became a practicing reality, and there would be grave implications for the citizens of the twentieth century. The coup was launched on the night of the 24th. Signalled by a blank shot from the cruiser Aurora, Lenin re-emerged from hiding in the town of Smolny, where he took command of his armed proletariat Red Guards who proceeded onto Petrograd and, without need of one shot, seized control of its primary nerve centres including the post office, train stations, power stations and the central telephone exchange. At 2am on the 25th, the virtually unoccupied Winter Palace – former home of the Tsar and new premises of the Provisional Government – was taken bloodlessly by a small group of Red Guards. Accidentally happening upon the remnants of Kerensky’s government, the leader of the assault shouted: “I inform you, all you members of the Provisional Government, that you are arrested. I am Antonov-Ovseenko, a representative of the Military Revolutionary Committee.” The mainly illiterate revolutionaries then forced the prisoners to write up their own arrest papers. 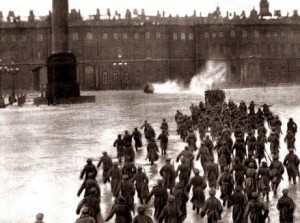 So unlegendary was the coup that in 1920 Soviet propagandists staged a hagiographical re-enactment of the “Storming of the Winter Palace” in order to mythologise an event most Russians had never heard of. But the truth is, the Bolsheviks came to power after a single day of near-effortless revolution that resulted in only two casualties. The death toll would, of course, rise considerably, inconceivably so, as one of the bloodiest civil wars in history erupted. Only in its aftermath at the end of 1922 would Bolshevik power be consolidated. A year later, Lenin would be dead – and the utopian humanism of Marxist theory would give way to the tyrannical reality of Stalinism. The Russian Revolution has always confused me. After reading this I decided to try and figure it out a bit more. After about an hour of reading online this is what I’ve got. Let’s see……. two revolutions, right in the middle of World War 1. Then Russia exits the war. Then civil war. Reds vs White. The Reds win. Millions dead. But after reading about what happened to Trotsky, I think I’m even more confused. Anyway thanks for this entry which inspired me to at least try and figure it all out! But, as evidenced from Journeyman’s comment below and my response, the historiography of the Russian Revolution is indeed complex. It is, however, endlessly fascinating. And for those with even a modicum of interest in social history and its impact on here and now and tomorrow, there can be few more intriguing subjects. This view of the October revolution – that it was a coup d’etat and that Stalin was the inevitable sucessor to the tradition of Lenin and Trotsky – is an old chestnut. And one shared ironically by capitalists and some anarchists (but by no mean all – Victor Serge for example supported the October Revolution). This view here ignores the critical role of the ‘July Days’ when the Socialist Revolutionary and Menshevik provisional grovernment failed to meet both the demands of the worker’s soviet councils, or the near-universal demand of the masses to end the war. That’s why the Bolsheviks so rapidly built support, most significantly in the St Petersburg Soviet, with the slogan ‘Bread, Land and Peace’. By October there were effectively two governments in Russian cities – the ‘legitimate’ Provisional Government increasingly isolated from the masses, and the de-facto governement of the workers’ councils -the soviets – reflecting the mood in the streets. The Bolshevik seizure of power merely formalised this with the slogan of ‘All Power To Soviets’. If you want a classical Trostskyist analysis of the events have a look at the articles over at: http://socialistworld.net/view/142. Hi Journeyman, and thanks for your very interesting and informed comment. As I understand it, even though the Bolsheviks were an acting parallel government, they were not internationally recognised (which was essential if anything was to be done about the war) – and even though they’d acquired a majority in the St. Petersburg Soviet, this obviously was not enough to control power – hence their need to take it! As for the July Days, that also signaled a resurgence amongst the right wing – lest we forget the Kornilov Affair. Considering Kerensky’s response to that, it does seem pretty remarkable that the Bolsheviks were able to seize power with such ease. And I guess that was my point … the Soviets were clearly somewhat surprised too, hence the 1920 dramatisation. Thanks for the link and book suggestion, which I shall duly check out – and, once again, thank you for your thought-provoking comment. Such a shame the Revolution was isolated and destroyed by civil war, had Germany been taken, the whole history of the 20 century could have been so much better. I studied this for years and concluded that it was a naked power struggle which was only ever going to end in mass death. Lenin and Trotsky deliberately murdered the middle classes and others – even little children stealing bread because they were starving. Ideology was just a cover story for a group of utterly ruthless killer politicians. I feel for the Russian people, and indeed for all the people of the former Russian Empire and later the USSR. How sad for them to go from 300 years of Romanov rule to then decades of Communist oppression, to the fall of the Iron Curtain, and then to the present time, with no clear political culture of representative, constitutional government, with protection of individual civil liberties, and checks and balances within the government itself. Perhaps this Western political worldview could never truly take root in their culture, because there was never a precedent for it. They have always been under a “strongman” of one type or another, and they have suffered for it.